Resistance temperature detectors (RTDs) are based on the principle that the electrical resistance of a metal increases as temperature increases a phenomenon known as thermal resistivity. Thus, a temperature measurement can be inferred by measuring the resistance of the RTD element. RTD’s are constructed of a resistive material with leads attached and usually placed into a protective sheath. The resistive material may be platinum, copper or nickel with the most common by far being platinum because of its high accuracy, excellent repeatability, and exceptional linearity over a wide range and it exhibits a large resistance change per degree of temperature change. 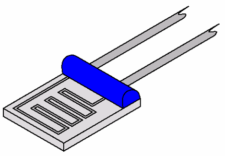 The two most common styles of RTD sensors are wire-wound and thin film. Wire-wound RTDs are manufactured either by winding the resistive wire around a ceramic mandrel or by winding it in a helical shape supported in a ceramic sheath – hence the name wire-wound. To manufacture thin film RTD sensors, a thin resistive coating is deposited on a flat (usually rectangular) ceramic substrate. Copper and nickel are generally used in less critical industrial applications due to limited accuracy and linearity, and relatively narrow temperature ranges. Nickel elements have a limited temperature range because the amount of change in resistance per degree of change in temperature becomes very non-linear at temperatures over 300 °C. Use of nickel RTDs has declined over the years due to its perfor­mance limitations and since the cost of Platinum RTDs is now a very small premium, if any at all. Copper has a very linear resistance to temperature relationship but, since copper oxidizes at moderate temperatures, it should not be used over 150 °C. Copper RTD’s are commonly used in winding temperature measurements of motors, generators and turbines. 10 Ω copper RTDs have been most common over the years but are now giving way to 100 Ω and even 1000 Ω models to get better resolution thus providing a more accurate measure­ment. Platinum RTDs are also growing in popularity for these applications. Due to the harsh conditions in these windings and the fact that the sensors cannot be replaced without disassembly of the motor, many vendors and users are opting for dual element RTDs and some are using thin-film RTD designs due to their greater tolerance for vibration and subsequent longer life expectancy. Rosemount Inc. 2013 The Engineer’s Guide to Industrial Temperature Measurement Literature reference number: 00805-0100-1036 January 2013 page 32.